While WhatsApp is still the king of messaging with over 1 Billion downloads on Android, more and more people are using Telegram as well. WhatsApp’s simplicity and the ability to make voice calls makes it a desirable chat app for many, however, Telegram is preferred by those who like security along with some features like the ability to add 5000 members in a group chat and message syncing across multiple devices. 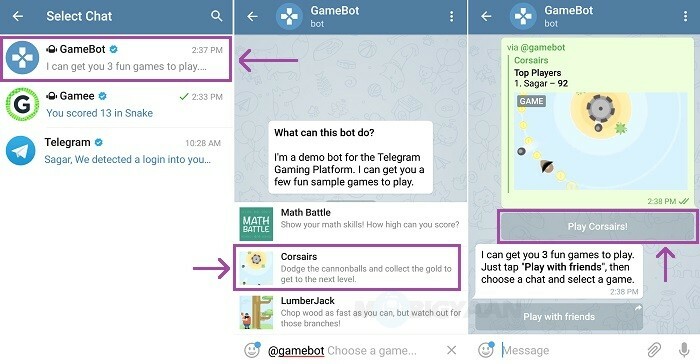 Earlier this week, Telegram rolled out an update which makes it possible for you to play games from within the app. You can play games with your friend from within the chat and share score as well. Of course, this isn’t something new as Facebook already lets you play some hidden games in its Messenger app. However, this is also something which isn’t available on WhatsApp. 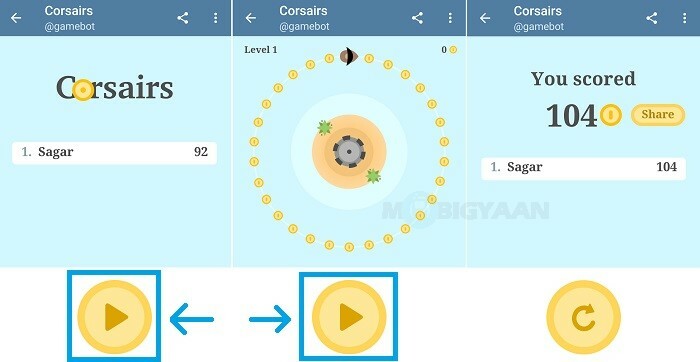 We show you how to play games in Telegram with the help of this tutorial. Read on. Step 1: Make sure you have the latest version of Telegram installed on your Android device. You can download it from Google Play Store. Step 2: Now open the Telegram app. As soon as you open it, you will see magnifying glass icon which is also called search icon. Tap on it. 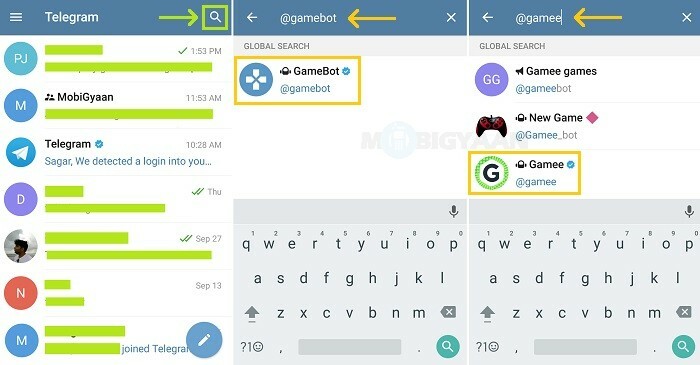 To play games in Telegram, you can either type @gamebot or @gamee in the search box and then the tap on GameBot or Gamee. We will first go with Gamee (@gamee). Step 3: After you tap on Gamee, a new chat screen will open. Tap on the ‘Restart‘ option which is provided at the bottom of the chat screen. You will then see multiple options, you can choose to either play trending games or select a game from a particular category. We chose to play a random game by tapping on ‘Random Game‘. Telegram then presented us with Snake, one of the most popular mobile games of old times. You will also be presented with two options – Play Solo and With Friends. We wanted to play solo so tapped on ‘Play Solo‘. If you want to play it with a friend, you can tap on ‘With Friends’. You can then tap on the Play button to start playing game. All the games in Telegram are pretty simple and have very simple controls making it easier for you to pass time and have some fun. 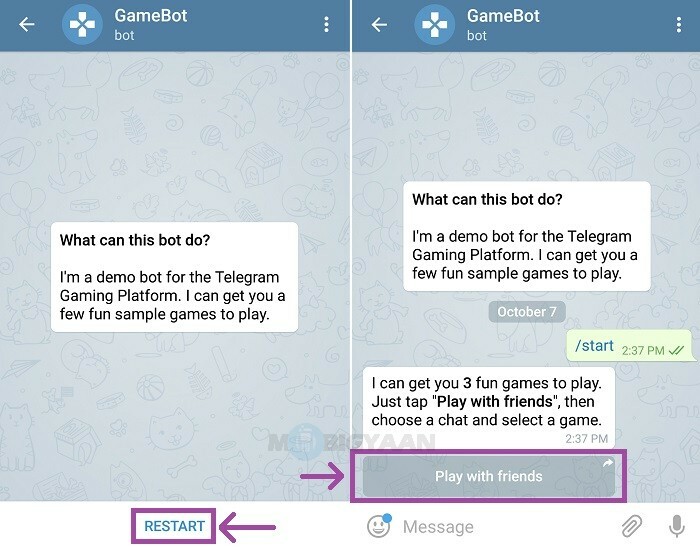 Step 4: Now let’s see how we can play games in Telegram using GameBot. Perform Step 2 and then tap on GameBot. You will then be taken to the GameBot chat screen. Tap on the ‘Restart‘ option provided at the bottom of the screen and then tap on ‘Play with friends‘. After you tap on the game name, you will be presented with two options – Play Corsairs and Play with friends. Tap on Play Corsairs to start the game. You can then tap on the Play button to start playing the game. 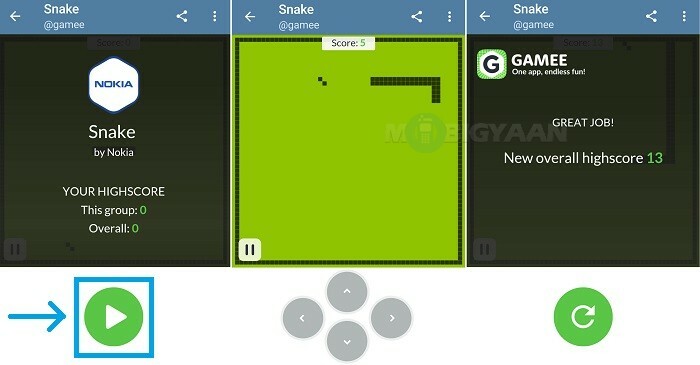 While there are around 10 games from Gamee (@gamee) that you can play, GameBot (@gamebot) only offers three games. However, the games from GameBot had more responsive controls as compared to the ones from Gamee. 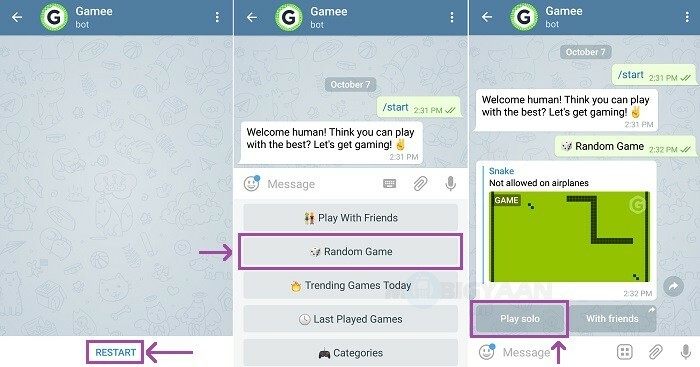 You can also play games in Telegram by typing @gamee or @gamebot in any chat to start playing the game. If you are thinking that adding this gaming platform to the app has increased its size, let us tell you that these games are built using HTML5 and load just like any normal webpage does. You can also open these games in web browser if you want. For more tutorials, you can head on to our ‘How-To Guides‘ section.